We’re all familiar with the old Nav: Lincoln’s well-renowned, clunky, luxurious utility unit in which many owners decided would look better with 24″ inch rims. Fortunately, that didn’t last long as they updated it to a proper, more refined–and less clunky– luxury truck per the 2013 model. Unfortunately, that, nor it’s more recent model years, could stack up with the competition mainly because of it’s apparent lack of luxuriousness for it’s time. But not this time. 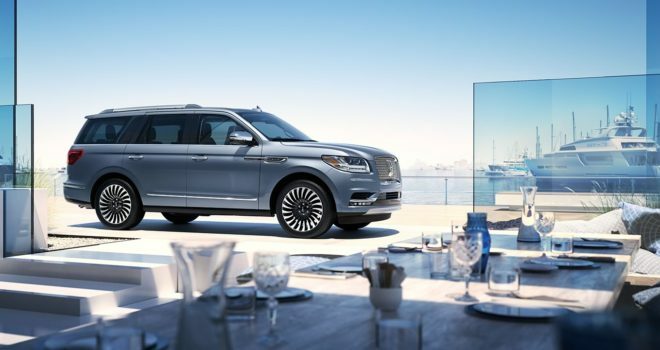 A bigger and better model flaunts it’s opulence amidst the swamp this year with the 2018 Lincoln Navigator. This time, totally throwing clunkiness out of the window. 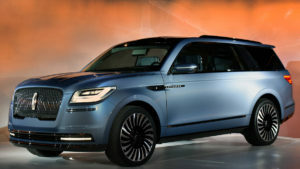 To execute it’s prey, this ‘Gator has inherited a quieter strategy: Lincoln’s Quiet Luxury philosophy. O’, the beauty of genetics. Here are the updates that quiet the interior: Laminated windows, a noise-cancellation system, tuned heating and cooling air ducts for minimal noise, and tires tuned to a mere whisper in response to the pavement. Shhhhh. Quietly, now. That is until your song comes on and you’re​ ready to pump up the 20-speaker Revel Ultima stereo. What’s a Nav without a sound system, amirite? There’s more updated tech that can connect to your preferred smartphone of choice as well. I personally recommend the LG G6, but who’s asking? The seats nearest the dash don’t get all the fun, however. If you’re a passenger in the second row of seats, you have your own audio controls. 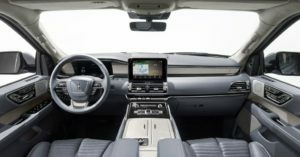 And, if you’re a cooler​ passenger, you’ll opt for the entertainment system upgrade that’ll give you personalized 10-inch screen entertainment mounted on the seat in front of you. SD, HDMI, and wireless Android connections come with the screens. Onboard Wi-Fi is standard, too. Xbox, anyone? The rest of the car is drenched in stitched leather seats and LED lighting and bells and whistles to satisfy your expensive purchase. It’s quite simple elegance. Above you will be a panoramic sunroof so nature is never too out of reach. Speaking of reach, have you seen those butterfly doors? Wow! Now, for the not-so-natural, the engine: Here, we have a 3.5-liter twin-turbo V6 hooked to a 10-speed auto that supports 6 driving modes. And if that was too many numbers for you, an estimated 450 horsepower and 500 lb-ft of torque is expected to push it’s all-wheel-drive system. It also comes with auto start/stop technology to optimize MPGs. Not to mention, it’s shaved 200 pounds since it’s remodeling​. 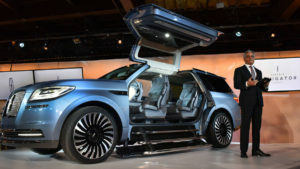 Lincoln is giving the SUV arena some competition this year and ensures it will be a formidable opponent. With that being said we can expect higher MPGs, zero to 60, towing capacity, and price tag. The new Nav should roll out later this year. Prepare yourselves for a new beast in the streets. Odds are you won’t even hear it coming.